Articles and information about autism and related issues. Happy 14th birthday to my sweet and smart son, Jacob! He has overcome many challenges in his short number of years, but he has always been happy and kind to everyone, confronting his issues with grace, determination, and humor. A natural musician he plays piano and saxophone, making the world more melodic and meaningful in the process. It’s challenging for us both with my living so far away, but he is always close by in my heart (along with my younger son, Max). I am so inspired by the person Jacob is and the man he is becoming! Light It Up Blue on World Autism Awareness Day! Yesterday was April Fool’s Day, but Autism is no laughing matter. Autism often locks individuals in a world of their own, but on Monday, April 2, 2012, the planet will join together to “light it up blue” today for the fifth World Autism Awareness Day (WAAD). The inaugural WAAD was observed on Wednesday, April 2, 2008. The incidence of autism diagnosis has exploded in recent years: in 2000 1 in 150 children were diagnosed, whereas the most recent figures indicate that 1 in 88 children have received a diagnosis. This is a 20% increase from the previously reported 1 in 110 children who received a diagnosis! More troublesome, according to noteworthy additional facts, Autism affects boys more commonly than girls — the incidence of diagnosis is now 1 in 54 boys! Previously, that number was 1 in 70. As I have previously noted, I am personally touched by this increase in autism diagnosis: my eight year son, Jacob, received his autism diagnosis just before his third birthday. Since then he has made remarkable progress, most notably due to early intervention services such as Applied Behavior Analysis services provided by the Center for Autism and Related Disorders (CARD). Due in large part to CARD, Jacob’s inner light now shines brightly. He has emerged into the thoughtful and intelligent little boy he always was. 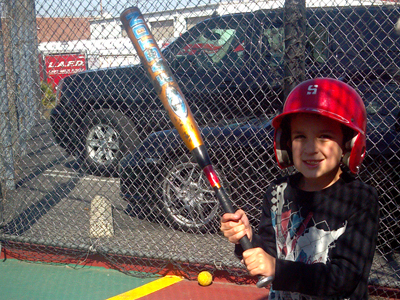 He loves to tell bad jokes, do math, learn about the life, and he even recently tried out a batting cage! He can now overcome his obstacles with eagerness and enthusiasm. All this — and much more — from a sweet little boy who initially only spoke in 3 to 6 word sentences, lined up items, heavily stimmed and exhibited many obsessive compulsive behaviors. Grateful is a word that barely communicates how I feel. Despite the many challenges he has faced, Jacob continues to inspire and impress me. I am so proud of the progress he has made, and will continue to make. It is my hope that Jacob can always exist in his ebullient essence. By all accounts, Jacob is blooming! I remain committed to Jacob’s enduring progress and will forever be his most ardent ally. I continue to make the most of my moments with him and my younger son, Max, and celebrate his achievements every day. And so, even if you aren’t personally affected by Autism — although the chances of that are continue to decrease while the number of diagnoses increase — I encourage you to make an effort today to learn more about autism and understand the unique individuals who share that diagnosis. Sometimes dates make a difference. August 2, 2006 is one of them: it was on this date that my older son, Jacob, received his official Autism diagnosis from Robert J. Rome, PhD of the North Los Angeles County Regional Center. At the time, Jacob was slightly more than a month away from his third birthday. Receiving the diagnosis was an emotional experience, though it was not entirely a surprise. Actually, in many respects it was a relief because having the diagnosis allowed Jacob to receive an array of helpful services for which he did not previously qualify. At the time of his diagnosis Jacob had very limited speech (3 to 6 word sentences were the extent of his verbal communication). He also lined up items, heavily stimmed and exhibited many obsessive compulsive behaviors. In addition he had many fears and also lacked basic social skills. Despite these challenges, he emanated a beautiful and loving spark that just needed some help to shine more brightly. Since then Jacob has made remarkable progress, most notably due to early intervention services such as Applied Behavior Analysis services provided by the Center for Autism and Related Disorders (CARD). Founded in 1990 by Dr. Doreen Granpeesheh CARD is a leading provider of autism services. Due in large part to CARD, Jacob’s inner light now shines brightly. He has truly emerged into the wonderful, thoughtful and intelligent little boy he always was. Grateful is a word that barely communicates how I feel. He is fascinated with numbers and can calculate large sums. His favorite number is “infinity!” Not surprisingly he also loves Buzz Lightyear (“to infinity and beyond!”). For a while he could even tell you the day of the week on which your next birthday would fall! Actually, I suspect he still can, but his therapists have discouraged the behavior. He also loves to tell bad jokes — specifically those in the classic “knock, knock” variety. He is also a wonderful artist who loves to draw and paint. Although I am his Dad, I can honestly say he has an impressive talent. It makes me smile that he can now not only communicate verbally but artistically as well. Occasionally he enjoys playing music with his brother, Max. He is also an “old soul” and has engaged me several times about topics seven-year old boys don’t often ponder. Once he asked me “Dad, do you have to be dead to be in heaven?” I replied, “I suppose you do.” His response: “But God is in heaven and he isn’t dead!” Nietzsche retorts about God possibly being dead aside, I was stunned that this little boy was thinking about such big concepts. More recently he asked me what is on top of heaven! Looking to the future, one of my goals is to eventually create an organization called the “Ourtism Association.” The mission of the organization — named to recognize how autism affects everyone in a family and that it is “our” responsibility as a society to help — is to provide supplemental income to families and adult individuals with a diagnosis. Right now it is only a dream, but I am working to make it a reality someday. My “big harry audacious goal” (nod to Jim Collins) is to raise enough money to provide $50,000 to 50 families each year. I suppose that isn’t outrageously audacious (it is “only” $2.5 million! ), and 50 families is the tip of the iceberg, but my own experiences have inspired me to make a difference. This would be my contribution to that noble mission. On a personal level, I will continue to encourage Jacob as the unique individual he is. I enjoy experiencing educational activities with Jacob, but also recognize his need to be silly. Despite his uncommon maturity, the last thing I want to do is rush him into adulthood. It is my hope that Jacob can always exist in his ebullient essence.